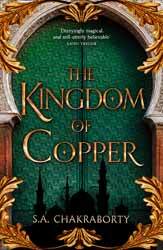 The Kingdom of Copper (2019. 625 pages) is the second book in the Daevabad Trilogy, written by S. A. Chakraborty. The book opens five years on from the events in The City of Brass. In this novel we have left the world of humans far in the distance, with most of the story being based in and around the royal court. Having been made to marry the heir to the throne, Nahri continues to do what she can with her healing skills, all the time trying to find a way of breaking her people’s servitude. Prince Ali, meanwhile, has fled the capitol after getting, unwittingly, involved in a revolution. With a price on his head, he flees into the harsh tundra which surrounds the city. Nearly caught and murdered by assassins, he flees through water, only to discover that he no longer needs to breathe when submerged. He further discovers that he has an affinity to water and can locate and influence it, but the influence goes both ways. Dara has been given refuge by Nahri’s mother. Although he longs to put his vicious past behind him, she intends to use him for the weapon that he is. As the city prepares for the centenary celebrations, these three stories will once more intersect and that intersection will bring war and death. I really liked the first book in the trilogy and in some ways the new story is even better. Chakraborty has much in common with George R. R. Martin, a claim that is often thrown around by PR companies about their authors, but in this case the comparison is valid. The author is not afraid of action sequences, they are generally well paced and she always ends each book with some crescendo of a battle, but that is not the main focus of the books. Like Martin, Chakraborty is interested in her characters and their situation and, like Martin, her characters are not perfectly black or white. There is many a time when you could quite happily slap Nahri for behaving like a selfish brat, other times she exhibits great bravery. Nearly all her characters exist in this grey zone, which allows their interaction to remain vibrant and often unexpected. Although the book mostly concentrates on Nahri as the main POV character there are a number of others which allows the reader access to the behaviours and thoughts that the author denies Nahri, as first-hand experience. This nice mix and their complicated personalities have the reader in a state of flux when deciding who to root for as no one is wholly good or evil. The author provides realistic and understandable motivation for all the characters and the political and personal machinations form the backbone of the story. I found it to be a refreshing change to the well-worn fantasy tropes and if Chakraborty can bring the trilogy to a close with a book as strong as the first two, she may well have created a fantasy classic.